Egypt announces referendum on an amended constitution as protesters take to the streets in defiance of new law. Egypt will hold a referendum on an amended constitution in December, the group drafting it said on Tuesday, reported Reuters. Hours before the timing of the referendum was announced, protesters took to the streets in defiance of a law passed on Sunday requiring police approval for gatherings of more than 10 people. 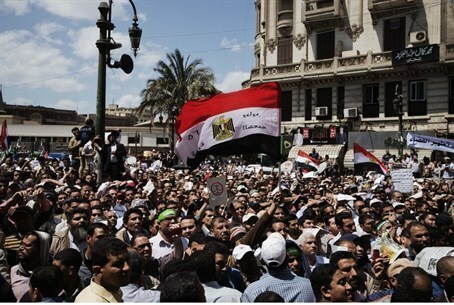 Police detained 28 people during the protest, the Interior Ministry said. A committee of 50 members, with few Islamists, began work in September on amending the constitution that was approved in a referendum last year after being drafted by an Islamist-dominated assembly. "The referendum will be held before the end of (December)," Mohamed Salmawy, spokesman of the constituent assembly, said, according to Reuters. These rmarks, however, contradicts comments made by Prime Minister Hazem el-Beblawi who said on Sunday the referendum would be held in the second half of January. The new constitution will guarantee the right to protest and ensure that demonstrations can be held if protesters notify authorities, rather than wait to be granted permission, Salmawy said, in an apparent effort to ease tension over a new law restricting demonstrations. Army chief General Abdel Fattah al-Sisi, who ousted Islamist president Mohammed Morsi in July, has promised the roadmap will lead to free and fair elections. Meanwhile, skirmishes broke out between security forces and protesters in downtown Cairo and police fired teargas and water cannon to disperse the demonstrations. They were marking the death of a liberal activist killed in clashes with police two years ago and expressed anger against the protest law. Hundreds assembled at the Press Syndicate and parliament while in Cairo, female students at Al-Azhar University for Islamic learning stormed into a dean's office and destroyed her desk. Al-Azhar University has been a hotspot of protests organized by the Muslim Brotherhood, of which Morsi is a member. A security official said Tuesday's crowd had not obtained permission to protest and had ignored warnings to disperse.